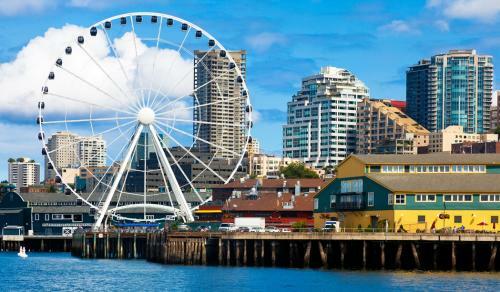 Seattle Great Wheel + Crab Pot Seafood = a Great Pot of Fun! Last week I had friends visiting Seattle for the night and they wanted a fun experience. They had already been to the Space Needle and Pike Place Market so I decided to take them down to the waterfront. We had dinner at the Crab Pot Seafood Restaurant on Pier 57. This restaurant was featured on Man vs. Food for its enormous seafood pots which are thrown right on the table and diners are encouraged to eat with their hands. After tying the bibs around our necks and grabbing our mallets we dove in to TWO Westport pots for four of us. Delicious steamed clams, mussels, shrimp,Dungeness crab, snow crab, andouille sausage, corn on the cob and red potatoes awaited us as we dug in to the seafood feast. In the summer time you can sit out on the deck and enjoy the sights and sounds overlooking Puget Sound but since it was November, we opted to dine inside. With the sailing memorabilia all over the restaurant, the sights and sounds were just as fun especially watching everyone trying to hammer open the crab legs! After dinner we wandered around Miner&apos;s Landing a bit looking at the arcade and the carousel, and some of the fun shops like Pirate&apos;s Plunder. We made our way to the end of the pier to the Seattle Great Wheel. It had been raining earlier but stopped for us so we could enjoy a nice fall evening. After purchasing our tickets for $14.89/ person we got in line. The waiting area is covered so if it happens to be raining there are no worries about getting wet. The wait was very short and we were soon in our own enclosed gondola. We were the last group loaded so we didn&apos;t have to wait long before we started going around. There were three rotations and it was such a fantastic view of the city skyline. We also watched a few ferry boats come and go. With four of us in the gondola we had plenty of room. Up to six people are allowed, depending on shapes and sizes it could get a little cozy. There is a VIP option that includes leather seats and a glass floor but there is only one and it is available on a first come basis. Next time I need to go during the day to get some more great photos!